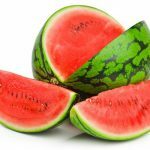 Avoid Gut Issues During Race Day | Nutri-Well Blog | Aliment Nutrition - Nutri Well - Nutrition, Fitness & Healthy Lifestyles! This entry was posted on 3rd April 2019 by Jamie Pugh. During endurance races like marathon running and long-distance triathlon, up to 90% of those taking part have reported gut issues during a race such as heartburn, nausea, bloating, abdominal cramps, vomiting, flatulence, the increased urge to defecate, and diarrhea . While these symptoms can be mild (we have all ran behind someone with a bit of gas), they can also be detrimental to performance, and even force us to drop out of the race. There are many reasons why we experience these symptoms during endurance exercise including changes in blood flow as we redirect blood that usually goes to our gut towards our working muscles, hormonal alterations, neural effects, and the mechanical movement of exercise. 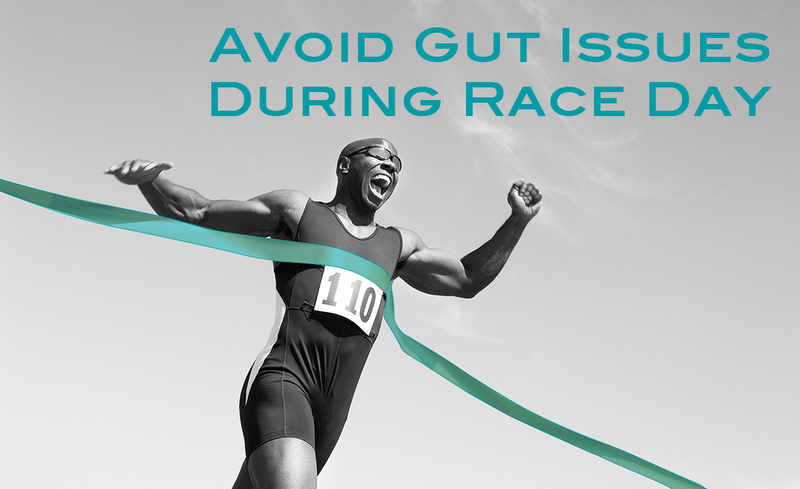 However, there are things we can do to reduce the likelihood of suffering from gut problems on race day. When it comes to racing, may people load up on carbohydrates the day before, and then take on drinks, gels and all sorts of other foods to try to fuel their efforts. However, if you have not practiced this in training, it could spell disaster. Consuming more fluid or carbohydrates than you are used to, or that you can tolerate, can lead to bloating, cramps, nausea, as it cannot be emptied from our stomachs and then absorbed from our intestines quickly enough. On your longest runs, practice matching your planned fuelling strategy exactly. It’s not enough to sip on a sports drink or taking the odd gel in training if you are then planning on taking on board much larger amounts on race day. If you are planning on 2 gels an hour, for example, then build in training sessions where you go through the exact strategy. Use the same brands as you are going to use on race day as well. If there are only a couple weeks left until your race, all is not lost. A study from Australia has shown that runners reduced their gut symptoms during a 2 hour run after 2 weeks of ‘gut training’ by consuming carbohydrates during their training runs . 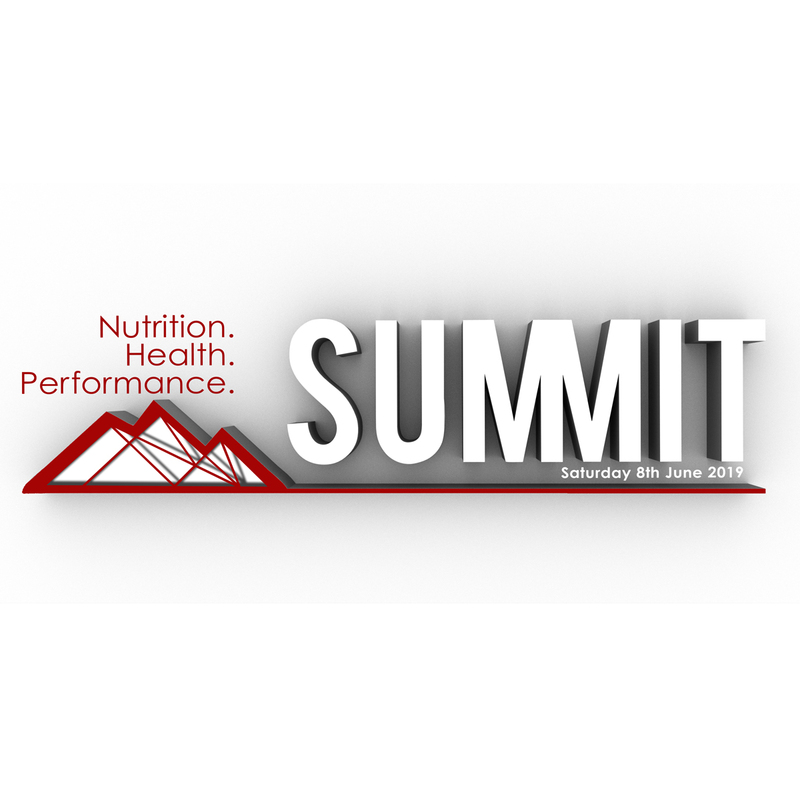 This lead to reductions in carbohydrate malabsorption and gut symptoms, and improvements in performance. It has been shown in a number of studies that greater increases in our body’s core temperature appears to lead to great gut damage and symptoms. Cooling strategies during the race such as cold drinks, water sprays, and finding shade can all help slow down the rise in core temperature. Another successful method to help is to acclimate to the heat before you even toe the start line. For those of us who maybe don’t have the time or money to head out on a warm weather training camp like the elites, there is a simpler and much more economical way to do this – taking a bath. 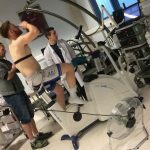 It has been shown that taking a 40 min hot bath (40C) submerged to the neck for 6 consecutive days has a large effect on acclimating athletes to exercise in the heat . What you eat the day before the race can have a big impact on your chances of experiencing gut symptoms. Like what you eat during the race, you should practice your pre-race day fuelling strategy in training. The day before a long training effort, practice eating the same breakfast, lunch, dinner and snacks that you plan to eat the day before a race. In general it has been found that, before competition, consuming high amounts of fat, fibre, red meat or non-digestible, fermentable carbohydrates (FODMAPs) have all been linked to gut symptoms of some sort [1, 4]. While removing all of these from your diet is obviously not advisable during everyday life – most of them are essential for our overall health – some athletes have looked to used reduced fibre diets with high glycaemic carbohydrates (e.g. white rice) and lean, easier to digest meats (e.g. chicken) in the day before a major competition. Think long and hard before taking unnecessary medications before a race. Non-steroidal anti-inflammatory drugs (NSAIDs) can worsen the damage caused to our digestive tract during exercise . Marathon runners report more gut symptoms after taking ibuprofen and aspirin, and show greater markers of gut damage . Lab4 probiotics are the first to show potential benefits to endurance athletes during exercise. 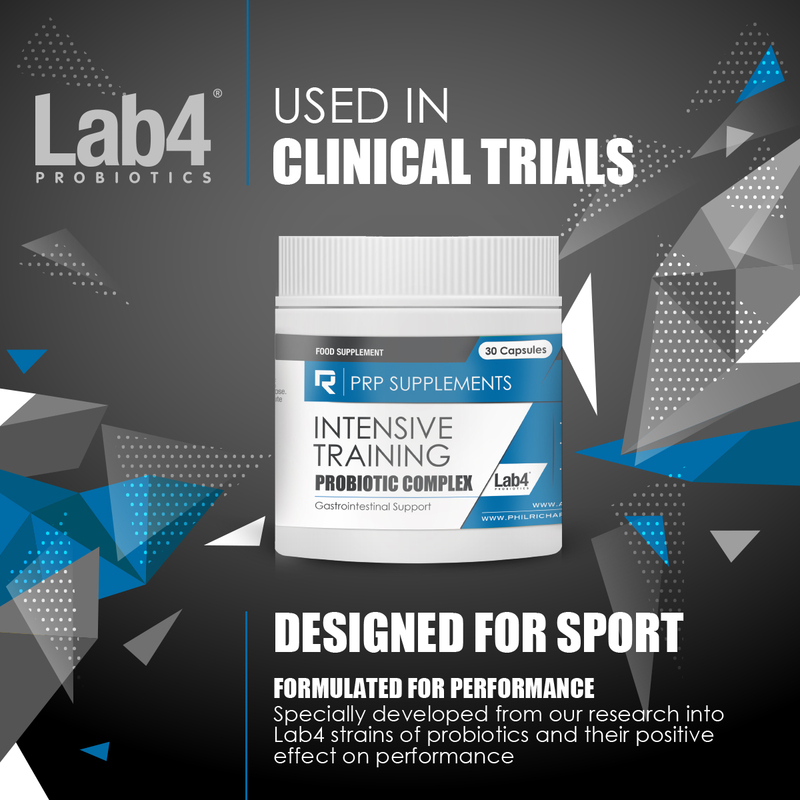 To date, Lab4 probiotics have been shown to reduce gut symptoms during training in triathletes , and during a marathon race in runners. When athletes have consumed Lab4 probiotics, they have reported fewer and less severe gut symptoms than those taking a placebo. 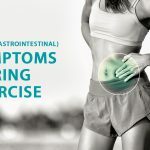 This is perhaps not surprising given the probiotics have been shown to be beneficial to individuals suffering from irritable bowel syndrome, who often share similar symptoms to endurance athletes. Costa, R.J.S., et al., Gut-training: the impact of two weeks repetitive gut-challenge during exercise on gastrointestinal status, glucose availability, fuel kinetics, and running performance. Appl Physiol Nutr Metab, 2017. 42(5): p. 547-557. Zurawlew, M.J., et al., Post-exercise hot water immersion induces heat acclimation and improves endurance exercise performance in the heat. Scand J Med Sci Sports, 2016. 26(7): p. 745-54. Roberts, J.D., et al., An Exploratory Investigation of Endotoxin Levels in Novice Long Distance Triathletes, and the Effects of a Multi-Strain Probiotic/Prebiotic, Antioxidant Intervention. Nutrients, 2016. 8(11).